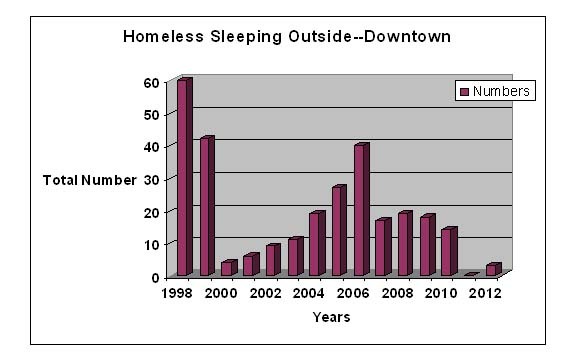 We did our count of the downtown homeless back in November, and posted the results on our website for this last year. It was a significant decline in the number of people sleeping outside. We have not seen these low numbers since 2100 Lakeside opened in 2000. Now, before we break out the champagne there are a couple of things to keep in mind. The shelter resistant have spread out to other sections of the city. There has actually been an increase in the number of people requesting shelter in Cleveland over the last year, and a large number of people are staying inside at the Metanoia project at St. Malachi on the weekends when we do the count. It does prove that if you offer a space that has high tolerance for difficult to serve people they will come inside. We outline a number of reasons on the page describing the population why we have seen a decline in the number of people who live outside. All of these items work together to result in a decline in the population. Not one magic bullet has caused a decline in the population. All of these trends work together to change the number sleeping outside. This is great news that there are in fact fewer people who risk their lives living outside, but we still have a ways to go to get everyone inside. Two big things that would result in a significant decline in the population: changing the law regarding sexually based offenders and establishing minimum standards for the operation of a shelter in law. The sexually based offender law unfairly stigmatizes people who have huge areas of the city where these individuals cannot live. While no politician wants to touch a law that is viewed as being tough on criminals, it is a stupid law. Most abuse of young people happens by relatives or friends and not a stranger. So all these laws that prevent offenders from living within 1,000 feet of a school or even working close to a day care center have the result of keeping people homeless for long periods of time and costing taxpayers millions. They have very little to do with preventing crimes against young people, but they have a heavy price for society. The shelters need to be better regulated to encourage people to come inside. I have talked to hundreds of people who resist going to shelter because they have been kicked out or because they have serious concerns about the operation of these publicly funded facilities. It is the only congregate living facility that does not have a law to protect the residents. So many people would come inside if there were greater protections against discharge and were more transparent.